Subscription businesses thrive by growing recurring revenue, but offering non-recurring options to complement existing subscription products/services allows businesses to get more creative with their offerings, boost revenue, and accelerate growth. Component Price Points that offer the flexibility to create multiple different price points for any given component. With Price Points, you can personalize pricing on the fly without having to create and maintain an unwieldy catalog of options. Create tax automation rules that are specific to your one-time components through our native tax settings or Avalara AvaTax integration. Include one-time components in our Rapid Offer Builder to configure, price, and quote custom packages and contracts. Configure volume-based, tiered, or stair-stepped pricing schemes for any one-time component. Automate billing workflows with the ability to add one-time components at signup or at any time throughout the life of a subscription. And since one-time components are not recurring, any revenue from these components are not reflected in our recurring revenue-focused analytics views. You’ll be able to analyze one-time charges through our Finance Report and, coming soon, revenue recognition reports. This new feature was designed to accommodate an endless list of one-time use cases. Below are some examples we have encountered, but ultimately, your business is in full control of how it structures and offers these one-time changes. You want to offer onboarding packages to implement and train your customers on their new products. 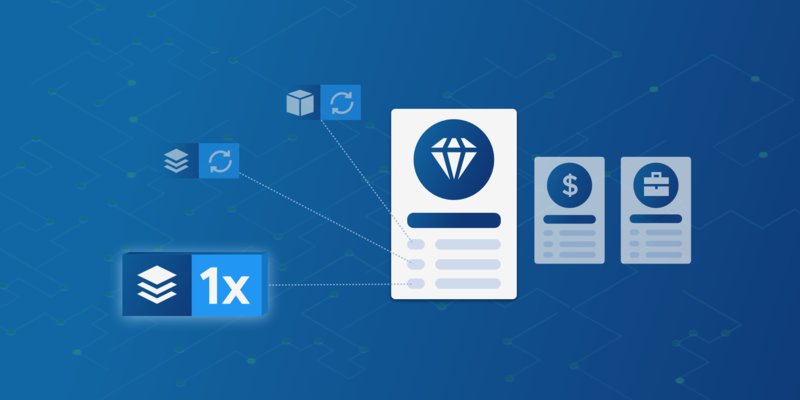 You can create multiple one-time components or one one-time component with multiple price points for different packages based on the level of service or amount of work involved. You want to offer import assistance and charge a one-time fee that’s determined by the number of records imported. You can create a one-time component and, optionally, configure volume-based, tiered, or stair-stepped pricing schemes based on different sized buckets. For example, you charge $0.50/record for 0-1,000 records imported and $0.25/record for 1,001-2,000 records imported and do an import for 1,212 records, the $303 one-time fee (1,212 x $0.25) will be added to their subscription. You want to offer an hourly rate for one-time jobs such as custom development work or training. You can create a one-time component with an hourly rate and then control the quantity of negotiated hours for any given project. For example, your hourly rate for training is $80/hr and you will provide 20 hours of training to a specific customer. When you apply the one-time component to their subscription and set the number of hours, the $1,600 one-time fee (20 hours x $80/hr) will be added to their subscription. You want to offer optional, one-time packages when a customer exceeds a certain threshold of usage. For example, you offer a messaging platform and a customer’s plan includes 1000 SMS messages each month. If the customer hits 1000 SMS messages, they have the option to buy an additional block of SMS messages just for that one month. You can create a one-time component for different blocks such as an additional 250 or 500 SMS messages. To learn more about configuring and using one-time components, check out our documentation. While our focus has always been centered around recurring billing, modern subscription businesses are constantly expanding and experimenting with different billing models which sometimes includes non-recurring billing needs. We’re excited about this new feature and the flexibility that it provides to our customers.